Shock And Anger Over Grimes/McKee Oscar Snub. Hedges Burnt. For the 19th consecutive year, many film aficionados across the county have resorted to violence after Donaghmore man Conor Grimes and his Coleraine comic compatriot Alan McKee were overlooked at the 87th Academy Awards ceremony in LA on Sunday night. McKee reportedly purchased a blue tuxedo in The Moy at the weekend, ‘in case they FaceTime us as a surprise‘ he was heard telling shoppers. Grimes had reportedly been on a no-fry diet since last month and was said to be practising smiling and crying. 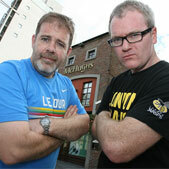 The pair, who are currently touring the country with their play ‘‘St Mungo’s Luganulk‘, were unavailable for comment although locals commented that Grimes appeared bleary eyed coming out of an off-licence in Dungannon at 2pm, having stayed up all night to watch the awards show with his loyal dog Malachi. The news adds to a barren run at the Oscars for the Tyrone movie scene. The last trophy to reside in the county was in 1959 by Galbally director John ‘The Red’ Talbot whose 15-minute subtitled Short Film ‘The Dufflecoat Man’, which depicted a day in the life of a door-to-door pitch fork and rake seller in the area, won a whopping 13 awards. Posted on February 24, 2015, in Donaghmore, Galbally, Moy, Newmills, Pomeroy and tagged alan mckee, coleraine, Conor Grimes, Donaghmore, Galbally, julia roberts, LA, Newmills, Oscars, Pomeroy, The Moy, tom hanks. Bookmark the permalink. Leave a comment.